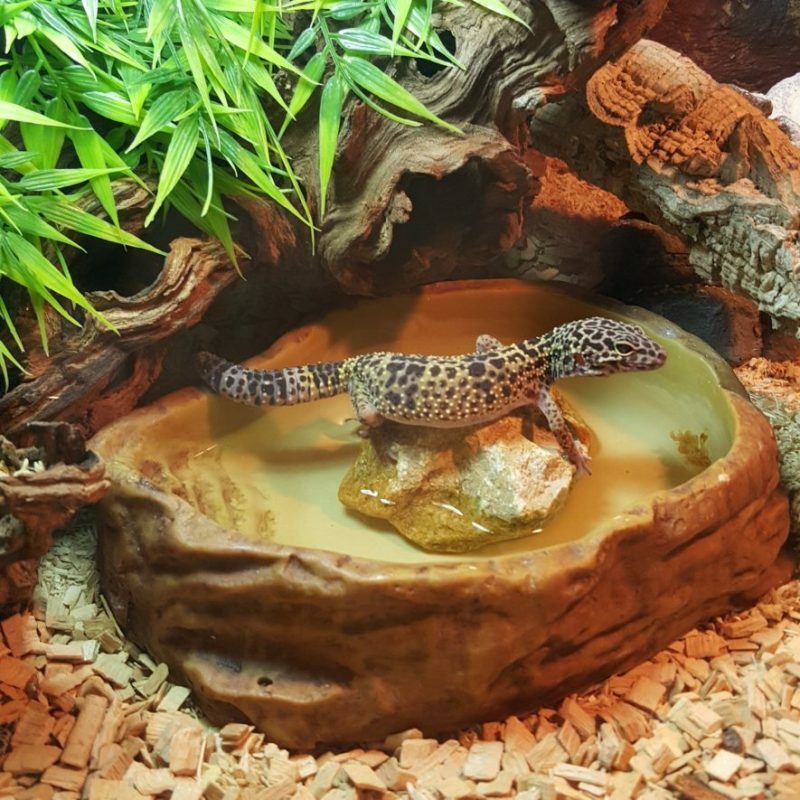 Leopard Gecko Habitat: How to Set Up The Ideal Tank? A natural setup is an essential part of your pet geckos’ well-being and health. In this guide find everything you need to set up the perfect leopard gecko habitat. Leos don’t require specialized lighting equipment. That leos still require temperature regulation within tanks, but not provided by bright lights? I firmly believe that a quality natural setup has been an essential part of my pet geckos’ well-being and health. Though certain elements can vary, all good leopard gecko tanks have some basic similarities. Let’s explore the best types of tank setups for one of the most popular pet species of lizard, the famous leo. A solid tank will be a basis for your leopard gecko vivarium setup. 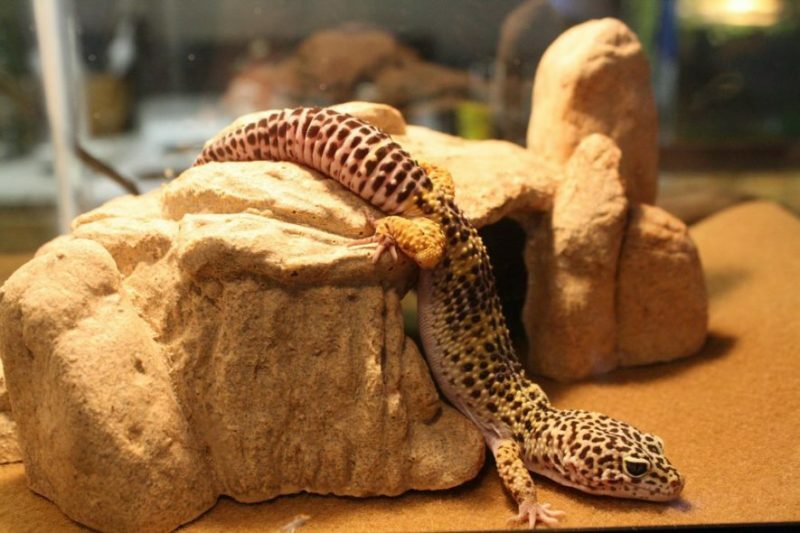 Leos are ground geckos and prefer tanks that are long and relatively shallow. Avoid tall and narrow tanks such as those commonly used for chameleons or other tree-dwelling species. A tank you will use for setting up your leo habitat can be made of different materials. I will cover the three most common types: glass, plastic, and wooden tanks. Glass tanks are a classic option – and my personal preference. Glass has the highest visibility of all materials, it is chemically stable (doesn’t leach chemicals), and it is easy to clean and disinfect. If thick enough and handled correctly, it is surprisingly durable – a well-kept glass terrarium can look like new for decades. The downside of glass is that it is heavy and prone to breaking. However, because leo tanks are generally not too big, the risk is undoubtedly smaller than for bigger glass terrariums or aquariums. Another issue with glass tanks is that they can be pricey. Buying second-hand tanks can save you some money. Plastic tanks, made out of PVC or ABS plastic, have become popular in the hobby because of their durability and adaptability. They are lighter and less prone to breaking than glass tanks, and their sides can be drilled in order to fit cables and equipment. Plastic tanks are either made out of separate plastic sheets, or come as professional, one-piece molded terrariums. They are usually expensive, but because you leos don’t require massive tanks, it is likely that you can find one for a reasonable price. The downside of plastic tanks is that the cheaper ones are usually transparent only on the front side, while others sides are opaque. Also, plastic tanks are slightly more prone to scratching, so you have to be more careful when doing maintenance. By construction, wooden tanks are similar to plastic ones. A plywood enclosure will have all sides made out of wood except for the front, which is usually made out of glass. Wooden enclosures are one of the cheapest options out there and are the easiest type to make yourself. Some reptile enthusiasts wisely turn wooden shelves into terrariums. Because of their size, leopard geckos are especially suitable for bookshelf enclosures, and a bookshelf setup such this one can save you a lot of time, money and effort when you are housing many geckos. The issue with wooden tanks is that wood is porous – it absorbs water which makes it prone to rotting and mold and makes it difficult to disinfect. The way to combat this issue is to apply a non-toxic, waterproof coating such as pond shield over the entire wooden surface. It will make smooth and waterproof, and also give it a nice, glossy finish. Providing adequate ventilation is a must for terrarium containing leopard geckos, or any other lizards for that matter. Ventilation in a tank can be passive, active, or a combination of the two. Passive ventilation is the most common – it is simply a mesh that covers the entire lid, a part of the lid, or another upper part of the tank. Active ventilation is achieved through electronic ventilators like those used inside your computer. There are two main mechanisms which are used for opening tanks. One is from above, through a lid – this approach is more common with small terrariums. The second is from the front, where the front glass of the terrarium slides to the side. The tank that opens from the front is a better option for several reasons. It is easier to access and clean, and lizards will be less fearful when you approach them from the front. Access from the top can trigger protective reactions since in natural habitat dangerous predators usually lurk from above. On the downside, with the front opening lizards are quicker to escape; also chances that you’ll leave the terrarium open by accident are greater. You shouldn’t open the tank as a means of ventilating it on a regular basis. The risk of escape is simply too great, no matter how docile your leo looks. Leopard geckos originate from the arid grasslands of Asia, so naturally, similar conditions should be replicated in captivity. There is no need to mist the entire terrarium as with tropical species of geckos. However, a humid spot in the terrarium is a must. In their natural habitat, geckos will burrow and seek moister and cooler environment when they need it, and having a humid spot is a way to replicate that. A humid spot is also necessary for the geckos to shed their skin properly. Without it, there is a great risk that old skin will get stuck on some part of their bodies, especially the toes. How to provide a humid spot for your geckos? Take a box, coconut shell, reptile cave or some other type of enclosed or semi-enclosed shelter, and put hydrophilic substrate inside – coconut coir, peat moss or eco-earth. Then mist the humid shelter until moist, and check it regularly to see if it has dried out. Geckos also need a shallow water tray in their tanks, preferably made from inert, natural materials (rock, porcelain, thick glass). The water should be easily accessible for them to lick it. Leopard geckos drink water a lot like cats do! Water should be changed at least every other day. Leopard geckos are ectothermic animals, meaning that their body temperature depends on their surroundings. That is why you need to provide a fairly constant temperature in their tank, as well as a temperature gradient – a warmer and a cooler area within the terrarium. Leos will bask in their hotspot whenever they require additional heat and then go to cool down in the opposite part once they get too hot. The optimum temperature for geckos is 75 to 85°F (~24 to 29°C) during the day, with the basking area going as high as 90°F (~32°C). If possible, the nighttime temperature should be in the 70s (~21°C). Black or red reptile lights will provide heat as well as non-intrusive lighting. However, they shouldn’t be used as only heating devices, and are best combined with heating pads. Ceramic heaters are put in the place of light bulbs. Unlike bulbs, they provide only heat and not light. They should be able to do the job when it comes to heating in all normal circumstances. Heating pads are simple heaters that are put under the tank. They are inexpensive and don’t waste a lot of power. The fact that they are placed under one part of the tank means that this will allow you to create a much-needed temperature gradient. Never use heat rocks or any direct heating, as these could burn your gecko’s velvety, sensitive skin. A thermometer to check the temperature, both in the cooler part of the tank and in the hotspot, is required to be sure that the temperature in the tank is within a good range. Leos are one of the rare captive lizards which won’t need a UV light in their tank. Being crepuscular animals, they do not use sun’s rays to synthesize vitamin D like diurnal animals do. Therefore, they don’t require an artificial version of the daylight either. Leopard geckos prefer dim light; lights that are bright tend to frustrate them. Black or red reptile lights will not stress your geckos, and will also provide some heat. Though they shouldn’t be used as a sole heat source. These lights are designed to be (almost) undetectable to a reptile eye. But you will be able to watch your unsuspecting geckos at night under the discrete hues of blue, red or green. The light bulb should be placed on top of the tank, but slightly outside of it. If the bulb is inside it must be covered by a wire mesh or a cage-like structure. This will prevent your leopard gecko from accidentally burning itself on it. A discrete daylight lamp can be added if you wish to create a more natural day-night cycle, which is always recommended. However, if you place your tank in a bright room, light from the windows could be sufficient for creating a day-night cycle. The choice of substrate is one of the crucial factors to your leo’s wellbeing since the wrong choice of substrate can lead to illness and even death. You should skip all types of sand, as well as other loose substrates. Besides being unnatural for them as they don’t come from sandy habitats, leos will inevitably take in some of the substrate material while feeding. Some geckos will even purposefully lick and eat gravel and sand they find in their tank in an attempt to increase their mineral intake and aid digestion. Unfortunately, if sand is abundantly available to your leos, they won’t be able to control the intake. That might end up with a bad case of impaction. Impaction happens when a gecko swallows a substantial amount of substrate, or other solid substances, which causes a blockage in the lizard’s intestines. Impaction is hard to treat and can be fatal. On the other hand, it is easily prevented with the right substrate choice and the right food. There is no need for any leo to suffer or die of this terrible health issue. Loose substrates: wood chips, walnut shells, etc. 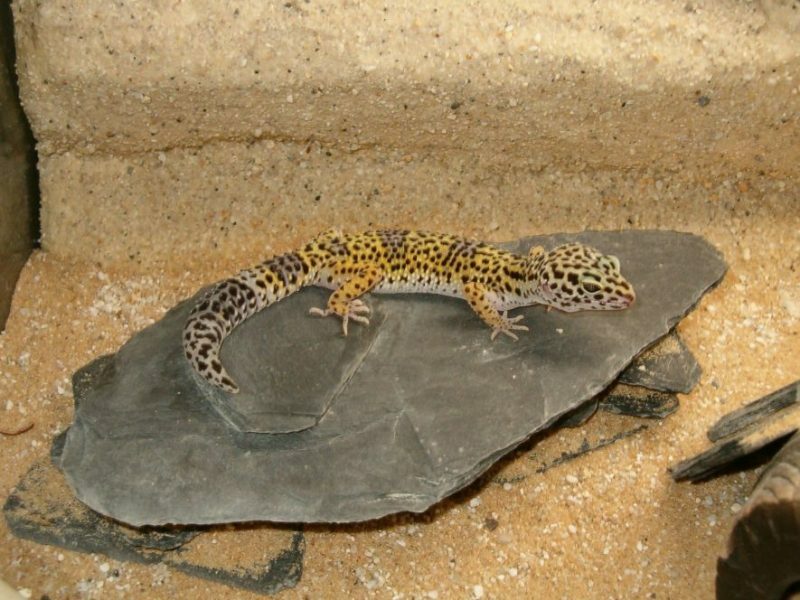 Here is the list of appropriate and safe substrates to use for leopard geckos. Paper towels are cheap and easy to change, so they make maintenance a breeze. On the other hand, they look completely unnatural, and they might not be able to provide good grip for older, heavier individuals. Paper towels are usually used with baby leopard geckos who eat and defecate frequently. Reptile carpet is an artificial substrate which is designed so reptiles can get a good grip when walking. When choosing a reptile carpet, get one from a quality supplier and research if it has been designed with leos in mind. A wrong kind of carpet can get leo’s claws stuck in the fiber. Also, reptile carpets have been known to start to smell after a short while. Pebbles are a natural substrate you can safely use with leos. They are not so easy to clean out as the mentioned artificial substrates. Although cooking them for disinfection is relatively easy once you manage to get all the pebbles out of the tank. Also, know that if you put a layer of pebbles that is too thin, they will rattle against the glass as geckos move. Stone slabs are perhaps the most attractive of all substrates – they have all the benefits of rocks including a good grip and natural looks. Also, it is easy to take them out and clean them. Just be careful when setting them up – there shouldn’t be crack or spaces between the tank wall and the edge of the slate in which gecko could hurt themselves or get stuck in the space. You should ensure they’re firmly attached to the bottom of the tank and don’t bang or slip. Ceramic tiles are economic cousins of stone slabs or slates. They are easier to get ahold of, lighter and possibly easier to install. The only trouble with ceramic tiles is if they’re overly smooth, geckos won’t be able to get a grip and can end up hurting themselves because of slipping. Fortunately, there are enough ceramic tiles with rougher surfaces and stone-mimicking 3D patterns. The coconut coir has probably been one of the most debated types of substrate among leo enthusiasts. It is cheap, looks natural and has antimicrobial properties which prevent rotting and bad odors. However, there are a couple of issues with coconut coir in a leopard gecko tank. In the case coconut coir is not kept wet – like it shouldn’t be in a leo terrarium – it produces fine dust, which can, in theory, harm your geckos breathing. And like other loose substrates, coconut coir can be swallowed in quantities that can result in a case of impaction. Except for anti-microbial features, other properties make coconut coir not worth the risk of using it in a leo tank. When we say decoration, people usually think about something that has a purely aesthetic value. But in the case of the vivarium, “decoration” is usually the part of the habitat animals will be interacting with the most. By breeder’s recommendation, I bought a terrarium with a stone wall made out of tufa limestone rock. While that wasn’t a perfect option since tufa is quite rough, it turned out as a great way to gain additional space in the terrarium since climbable 3D backgrounds efficiently increase the surface volume your lizards can move on. Though initially more expensive, it has tremendously improved my geckos’ movement ability and level of activity. My pets never suffered an accident because of the roughness of tufa rocks. But nowadays there are plenty of options for creating smoother and safer backgrounds. Rocks and bogs are essential decoration elements. With the help of rocks and wood, you can structure your leopard gecko habitat and provide shelter and climbing surfaces for pets. The only important thing is to follow certain safety guidelines. All structures that you create out of rocks must be firmly attached to other rocks or walls of the terrarium. A simple way is to use silicone glue. You should always opt for smoother rocks. My experience with tufa rocks that are quite rough has been excellent, but I would be reluctant to recommend them to anyone. On the other hand, nature doesn’t always offer smooth rocks, and completely smooth rocks can be hard for your gecko to climb. The bottom line is – when deciding what type of rocks to put in your terrarium, use your best judgment. Leopard gecko will often rest and cool down in their hideaway. A hideaway, or a hide-box, is a semi-closed structure. It could be a plastic box, reptile cave, wood or a rock structure that a gecko can use for hiding. I recommend having two hide-outs: one in the hot spot, and one in the cooler part of the terrarium. This will help your gecko to regulate their body temperature during the day and in any situation. For example, a gecko that has eaten well will usually pick a warm hideaway to digest his food. If you’re making a shelter out of stones and rock, make sure that they are safe and well attached. Do Leopard Geckos Need Plants In Their Tank? Leos do not require any plants in their tanks, living or fake. Still, some of you can’t imagine a natural terrarium setup without any greenery, so let’s explore plant options for a leopard gecko habitat. Unlike tropical vivaria, most of the real plants can’t thrive in a leopard gecko habitat because of the lack of light and moisture. One of the rare exceptions are the so-called air plants. These slightly alien-looking rootless plants are very low-maintenance and can be attached to walls or rocks. They should be misted once or twice a week, and have at least some degree of light. Some people recommend succulents with no spikes, though it will be difficult if you opted for a less-lit terrarium. Succulents are also sensitive to stale air. They are affordable and can be tried out easily but there is a risk of introducing intruders. Mites, nematodes or other tiny invertebrates may harm your leos. Many setups include artificial plants. Including artificial plants in your terrarium is a matter of personal taste. There are some amazingly realistic artificial plants out there. Elaborate models are prone to getting dusty, so be sure to give them a good wash when you do regular terrarium maintenance. Your leopard gecko will interact with his terrarium environment every hour of every day. That is the reason why a quality set-up is very important for your gecko’s quality of life. The aesthetic value of a good-looking vivarium as an addition to your living space should not be overlooked either. Was this introduction to the basics of leopard gecko habitat was interesting to read? If yes, feel free to share it. Would you have anything to add or share your perfect leo vivarium? Let us know in the comments. We would love to hear from you! Air plants – genre of about 650 plant species that can thrive without soil and are very hardy. Coconut coir – the fibrous husks of the inner shell of the coconut, used as a plant growth medium and tank substrate. Heating pads – also known as undertank heaters, these are thin heaters that are placed under the tank. They take up to half of the surface under the terrarium. Hot rocks or heating rocks – heating devices shaped like rocks and placed inside of the terrarium; hot rocks are not suitable as primary heating devices for any reptile and should be avoided altogether in the case of leos. Plexiglas – acrylic glass; transparent thermoplastic often used as a lightweight and shatter-resistant alternative to glass. Tufa rock – A type of a very porous limestone featuring a lot of small holes. Stone slab – a large flat and relatively thin stone used for paving or covering walls. Terrarium – a vivarium for smaller land animals – reptiles, amphibians, or terrestrial invertebrates, typically consisting of a glass-fronted tank and a more or less elaborate interior. Vivarium – An enclosure intended for keeping and raising animals or plants for observation or research; vivariums often try to recreate ecosystems for a particular species. Katarina is an environmental analyst and she has been involved with herpetology researches. She's been keeping reptiles for 15 years, mostly different species of turtles and leopard geckos. Her 2 lovely leos, Sonya and Mia are 15 and 14 years old. I really appreciate your tip on how a plexiglass tank would make a great secondary tank because of how much it scratches. My wife and I have been thinking of getting a new house, and we want to get our kids a pet to help them with the move. If we get them a gecko, I will be sure to choose something other than plexiglass for its primary tank!